The LG LD650EAL is a high capacity room dehumidifier for use in the home. This is a 65 pint dehumidifier so it is suitable for larger spaces and will effectively control relative humidity in a substantial living area, including a finished basement maintained at a temperature comfortable for every day living. It will also operate effectively in a partially finished or unfinished basement provided that the ambient temperature does not fall significantly below 65°F for extended periods (weeks or months). The LD650EAL is not typical of popular room dehumidifiers in being finished in black rather than the more familiar off-white shades more familiar to dehumidifier users. In this respect it looks more at home along side the video, audio and other electronic devices commonly found in our homes of which a high proportion are also finished in the currently popular black casings. For those who wish their dehumidifier to blend unobtrusively with such devices this may be an important consideration. The LG LD650EAL Dehumidifier is capable of removing 65 pints of moisture every 24 hours at 80°F and 60% relative humidity. These ambient temperature and humidity conditions are those under which all dehumidifiers certified by AHAM (Association of Home Appliance Manufacturers) are independently tested and LG is one of the many manufacturers that qualify for AHAM certification. The need for standard testing conditions arises because refrigerant dehumidifiers extract less water as ambient temperature and relative humidity fall. Standard testing conditions ensure that the relative power of an LG dehumidifier can be meaningfully compared with any other AHAM certified unit, such as a Frigidaire dehumidifier. Consumer reviews have not included complaints about the amount of water extracted so this is an effective dehumidifier in its class. The water is collected in a container, often called a bucket, with a capacity of 21 pints. There have been consumer complaints that this bucket is too small. In our view such complaints should be disregarded as the same comment is made about every dehumidifier we have ever seen reviewed. 21 pints is typical of the bucket capacity of most other dehumidifiers in this class. In general the bucket size is restricted because the manufacturers would have to make the dehumidifier larger, and a little heavier, to incorporate a larger bucket. These may be regarded as greater disadvantages by many. Also, the larger the bucket the heavier it will be when full. This makes it more difficult to remove without spillage, particularly for anyone with limited power to grip and hold the bucket, such as a person with severe arthritis of the fingers. Complaints have been made about the difficulty of removing and replacing the bucket. These are not widespread but do suggest this process may be a little more difficult with the LG LD650EAL than with some other dehumidifiers. The solution to the problem of emptying a bucket is continuous drainage. The LG LD650EAL is designed such that a hose may be attached and run to a nearby drain to dispose of the condensate. In common with most room dehumidifiers the drainage is gravity fed so the hose must run "down-hill" to the drain. If this is difficult you may wish to consider raising the unit a few feet above floor level, if this is possible. A few reviewers have reported difficulties with the attachment of the hose to the dehumidifier and reported that the hose has become detached and water has been spilt on to the floor. The LG LD650EAL Dehumidifier has an adjustable humidistat with which the desired level of relative humidity may be programmed. We suggest that a level of 50% relative humidity, or a tad lower, will be ideal to provide comfort for occupants of the home, inhibit mold growth, deter dust mites and control condensation. It is always advisable to monitor the relative humidity with a hygrometer (like a thermometer, but measuring RH instead of temperature). The sensors installed in room dehumidifiers are seldom precise enough to control relative humidity within an error range of less than 5%. We have noted a complaint from one reviewer that his LG LD650EAL would not control relative humidity to his desired range of 35% to 40%. This may be a little harsh since all refrigerant room dehumidifiers struggle to achieve and maintain such low humidity, regardless of the lowest level to which the humidistat may be set. Refrigerant dehumidifiers which can sustain such levels are considerably more expensive and are typically employed for water damage restoration work rather than domestic use. The LG LD650EAL Dehumidifier is reasonably compact and of manageable weight but is only typical, rather than exceptional, in its class. It is a portable dehumidifier with recessed carrying handles in the upper sides of the casing and the caster wheels usually found on room dehumidifiers. Two features of the LG LD650EAL not always found on room dehumidifiers are its timer and its auto-restart capability. If the power goes out, even briefly, it will stop some dehumidifiers until they are manually restarted. Auto-restart does what it says and switches the dehumidifier back on automatically when power is restored. This is useful if the unit is left unattended for a day or two. The minimum ambient temperature at which the LD650EAL may operate is 42°F. It has an auto-defrost feature which simply means that when ice forms on the evaporator coil the compressor switches off, suspending the refrigeration process, until the ice has melted. This feature is included to protect the dehumidifier from damage. At low ambient temperature the dehumidifier will extract very little water. It may spend more time defrosting than dehumidifiying. This means that it is less than ideal for use in low temperatures. By low temperatures we mean below 65°F for most hours of the day over periods of weeks or months. While suitable for a heated basement, or for a basement in warmer climates, it would not be the best choice for use in a basement, garage or other unheated space in colder regions of the country or the world. Finally we come to the issue of noise. All dehumidifiers make noise but some are less noisy than others. The main source of noise is the fan, not the compressor. The bigger the fan, the louder the noise and bigger dehumidifiers have bigger fans. The stated noise output of the LG LD650EAL is 52dB, similar to most other models in its class. Unfortunately it is not clear at which of the two fan speeds this noise was measured. The higher fan speed will be noisier than the lower setting. Complaints of noise have been made in many reviews of this dehumidifier. It is quite common for users to make such complaints, even about those dehumidifiers which are the quietest in their class, but the common thread in these complaints is secondary vibration, suggesting design issues and/or poor build quality. We have no definitive evidence and would welcome comments from any of you who own, or have owned, one of these dehumidifiers in order that we can publish it for the guidance of other prospective buyers. 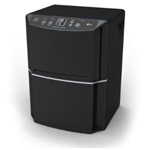 In dehumidifier reviews written by consumers this dehumidifier has received many negative comments and ratings. Some of the complaints have ocurred repeatedly and those are as follows. Breakdowns occurring within one or two years of purchase including, failure of the control panel, internal system leaks, failure of the humidistat and the dehumidifier running but not collecting any water. Excessive noise, due to seondary vibration of components. The attachment of the drainage hose to the dehumidifier is insecure, and the bucket is difficult to remove and replace. On the positive side a greater proportion of consumers were happy with this dehumidifier than can be said of the LD450EAL 45 Pint Dehumidifier. When it was working it was found to be effective, the controls were reported to be easy to use and the timer was appreciated. It is noteworthy that even some satisfied customers confrimed that this dehumidifier is noisy and generates excessive heat. Our conclusions are similar to those reached for the 45 pint model. There are clearly issues of reliability, high noise level and excessive heating of the air. These conclusions must be tempered in recognition of the greater proportion of reviewers who expressed satisfaction with this dehumidifier. There are examples of the same faults but in a smaller number of cases. The issue of noise and heat, however, seem to apply equally. In view of these indicators we do not feel able to recommend the LG LD650EAL to our visitors. Once again there are other models of equal power, incorporating similar features and at roughly the same price which we can recommend with greater confidence. If you would like to consider an alternative brand take a look at this page for the models we recommend to our visitors. The choice will depend on your judgement and you will certainly wish to sample opinion from other sources. We encourage you to do so.